This cute mini socks and mittens pattern has been created by Karen Butler Designs (who also produces Literally Yarn) and is available as an online download (VAT inclusive). Originally designed for mini mitten and mini sock blockers, the Mini Mitten and Mini Sock are also useful as Christmas decorations. They are quick to knit and can be knitted with small amounts of leftover yarn. Sewing up is simply threading yarn through live stitches and weaving in ends. Instructions are for 4-ply yarns, but thicker yarns with appropriate needles could be substituted to make larger versions. 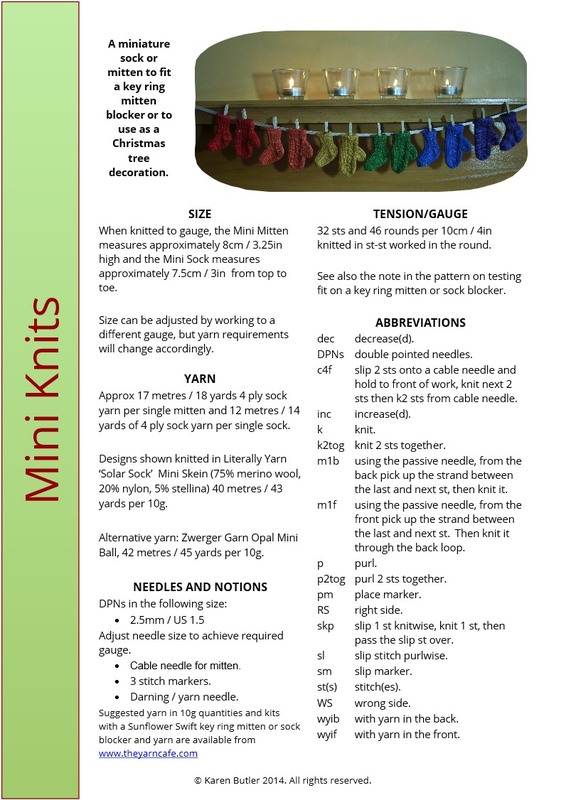 When knitted to gauge, the Mini Mitten measures approximately 8cm/3.25 inches high and the Mini Sock measures approximately 7.5cm/3 inches from top to toe. Size can be adjusted by working to a different gauge, but yarn requirements will change accordingly. Tension 32 stitches and 46 rounds for 10cm/4 inch square in stocking stitch. 3 stitch markers; darning / yarn needle. The designs shown are knitted in Literally Yarn ‘Solar Sock’ Mini Skein (75% merino wool, 20% nylon, 5% stellina), 40 metres / 43 yards per 10g. An alternative yarn is Zwerger Garn Opal Mini Ball, 42 metres/45 yards per 10g orMerino Sock Mini Skein.